The annual event will feature a number of local musical acts, including Fly Betty Band. There will be plenty of barbeque during the Hawgin' on Lanier KCBS BBQ Competition going on all weekend long. Plus, there will be craft and food vendors, games and activities for kids and much, much more! The cost of admittance is $10, and kids 12 and under get in for free. In addition, a number of local public safety departments will be cooking alongside the KCBS competitors in their own public safety cook-off. Teams from Hall County Fire Services, the Hall County Sheriff’s Office, the Gainesville Fire Department and the Gainesville Police Department will be among those participating. Proceeds from the event benefit Hall County Parks & Leisure’s scholarship programs and the Gainesville Jaycees’ Gut Check program and Empty Stocking Fund. 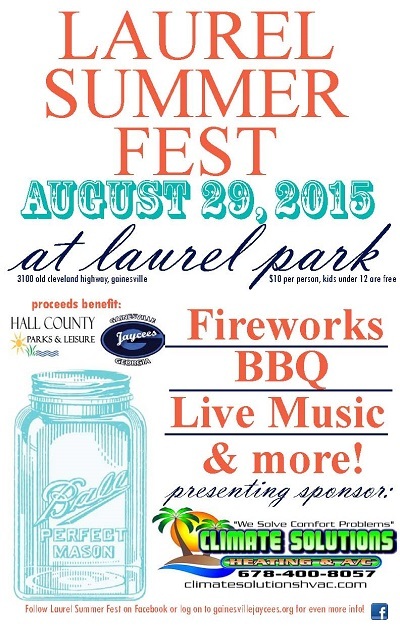 More information can be found on the Laurel Summer Fest Facebook page or at gainesvillejaycees.org.